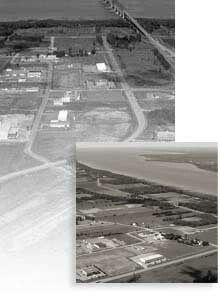 At the end of 1986, with support from the Government of Quebec, along with l'Union des producteurs agricoles (Agricultural Producers Union), the MRC (Regional County Municipality) and the City of Bécancour, as well as from the local business community, the first feasibility studies concerning the establishment of an industrial park, located at the foot of Laviolette Bridge, were undertaken. This is how, in the fall of 1988, Industrial and Commercial Park 30-55 Inc., the main industrial and commercial park for small businesses of the MRC, started officially to operate. Located at the foot of Laviolette Bridge, in Bécancour, Industrial and Commercial Park 30-55 Inc. mission is to provide industrial and office spaces to small and average businesses of the Centre of Québec area.
) and being offered at very competitive prices.